Fig. 6. Spine pairs origin of cerebral motor cortex in AC model and TBI model. The results of three dimensional tracing of MSBs for spine pair origin confirmation both two groups using Reconstruct® software. Proportion of sdMSBs was significantly increased in AC model (sdMSBs, p=0.0017; Student t-test). 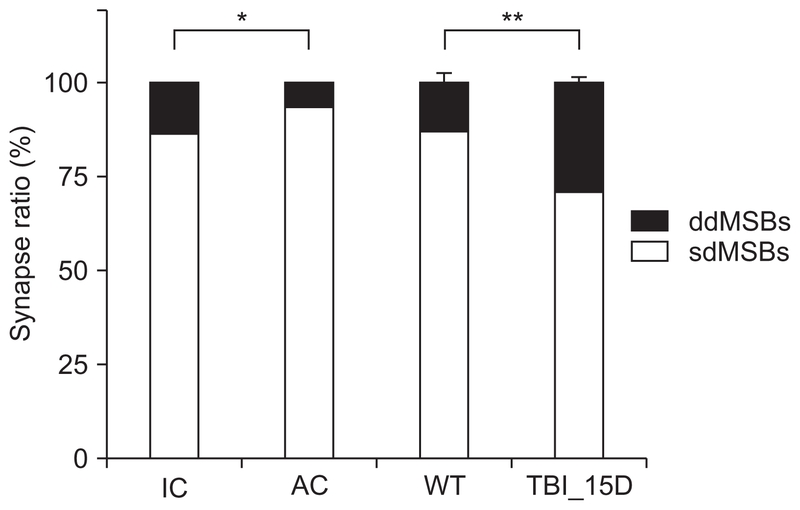 However, ddMSBs were major connection type of MSBs in TBI after 15 day model (ddMSBs, p=0.0135; Student t-test).